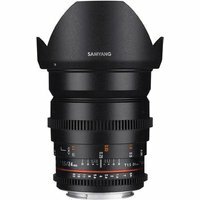 Samyang's 24mm T1.5 ED AS IF UMC II VDSLR is a wide-angle, manual focus cine lens designed for full frame and smaller sensor sizes and is known for its beautiful bokeh. It has been carefully engineered for professional film and video work, with the focus gear ring allowing the use of follow focus systems. The decoupled (de-clicked) aperture ring works quietly and smoothly during shooting. The stated T number of 1.5 refers to the actual light transmission of the lens and is particularly important in the film industry where light readings are normally made manually. A detachable petal-shaped lens hood is supplied.